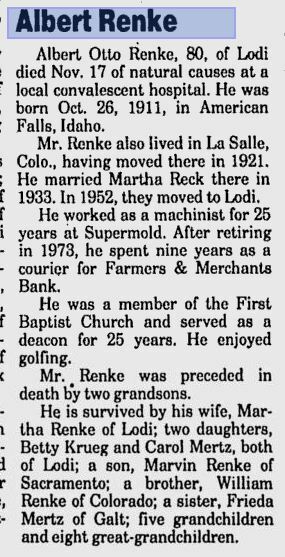 Today would have been Albert Renke’s 100th birthday. We’ve missed him for nearly 20 years. 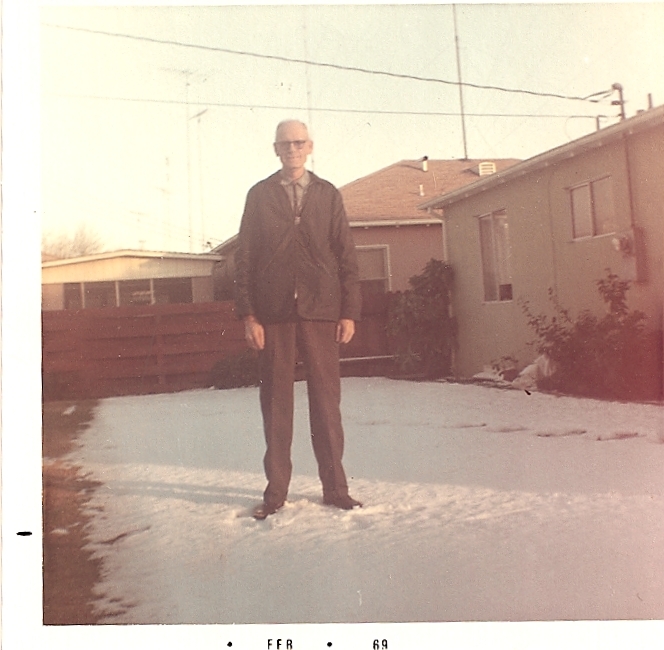 He was my Grandpa. He taught me golf (I’m not sure I really learned it, but he tried). As a grandpa, he was the best. Memories flood my mind of us all piling into the back of his little Ford Ranchero and heading off to get ice cream cones, Christmas Eve day golf excursions, and especially the joy he got the day of his hole-in-one. There are people who know better than me that he wasn’t perfect. But in his imperfection he trusted in the grace of Jesus Christ. He loved the Word of God. And he served the Lord faithfully through his church. His life still teaches me about faith and commitment. He laid a foundation for us to stand on. Happy Birthday Grandpa. I thank God for your life. Below is an article I wrote for our church newsletter, it included words about my Grandpa’s hands. I remember them with fondness and awe. They were hard and firm. Fingers permanently bent from years of abuse. No longer able to flatten on the table. They caused him pain, but they always served him. From years of holding tools, first on the farm and then in the machine shop, there was always a bruised nail, or a cut that was in the process of healing. These were hands that provided for his family in times when times were tough. These were also the hands that gracefully turned the thin and worn pages of his Bible as he read at the kitchen table, or that strongly upheld the hymnal during the Sunday service. These were the hands that taught me how to hold a golf club and paid for McDonalds when the day of golf was over and we were adding up the scores. My Grandpa’s hands told a story. And so do ours. Jesus’ hands told a story too. Barbara Brown Taylor wrote, “Look at my hands and my feet,” Jesus said, and when they did they saw everything he had ever been to them. They saw the hands that had broken bread and blessed broiled fish, holding it out to them over and over again. They saw the hand that had pressed pads of mud against a blind man’s eyes and taken a dead girl by the hand so that she rose and walked. They saw the hands that danced through the air when he taught, the same hands that reached out to touch a leper without pausing or holding back. When that world looks around for the risen Christ, when they want to know what that means, it is us they look at. Not our pretty faces and not our sincere eyes but our hands and feet – what we have done with them and where we have gone with them. What stories do our hands tell? Are they sharing in the work of Christ? We all know that our hands are not perfect. They may have done things that God did not intend for them. They have scars and wounds from life’s mistakes. But they can also have the touch of blessing, the touch of God’s tender and sacrificial love. This month, during our Sunday worship services we are going to take a look at the hands of Christ and prayerfully consider how we can be part of that work. How can our hands continue the work he started? Will our hands be permanent testimonies of grace and faithfulness, or will they monuments to a life motivated by individual desires? Jesus’ hands will be our example. His hands will be our guide. The work of His hands in and through our hands, will be our passion. What now? It’s May 22nd. In the spiritual battle for truth, a false teacher has been used by Satan to discredit the teaching of Jesus about His second coming. Rapture jokes are everywhere. People, even Christians, are being lighthearted about one of the most important realities – Jesus is coming again! And when He comes, it will be deliverance for those who trust Him. And it will be judgment for those who have sought their own path to salvation. As I’ve watched “Facebook” posts and read blogs and news articles, common phrases which intrigue me are “I survived judgment day,” or, “I survived the rapture.” The clear picture of Scripture is, if you survive on earth after Christ gathers his followers – that’s not good news. But what should believers do in light of this false prophecy? 1)	Be discerning. Do you know why this prophecy was untrue? Make sure you do some homework about why Camping is a false prophet. There will always be people who will distort the Word of God in order to further their agendas, or their egos. You must be able to spot them. There is no code in Scripture that tells us when things will happen! There is hope and direction given for those who are waiting the Sovereign Lord’s return. So, be about the mission of Christ. And be ready for His return – – it could be today, or tomorrow.